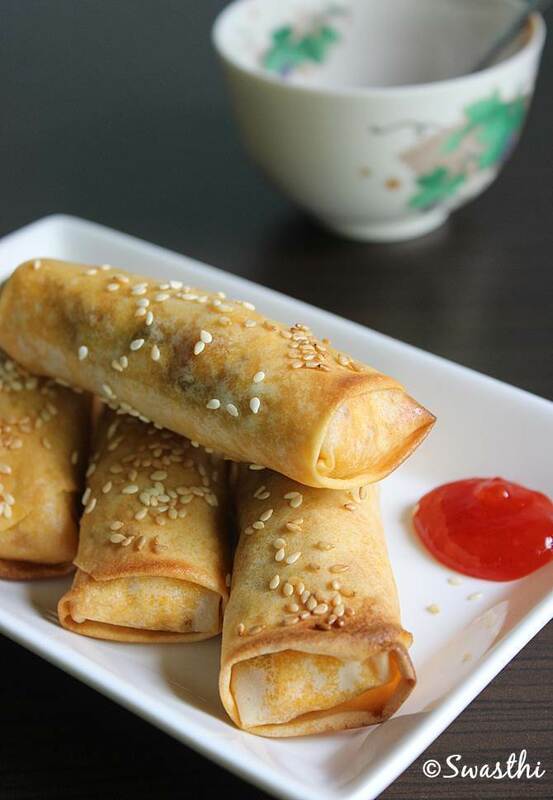 Spring rolls recipe – Chinese vegetable spring rolls are a popular starter or snack that is served in Indo Chinese restaurants. These are perfect as a tea snack or for a weekend brunch. 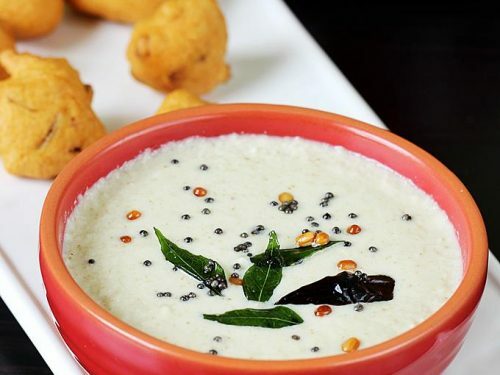 They can also be served for a dinner to accompany a bowl of delicious soup or noodles. But in India most commonly one would find people enjoying these with masala tea in most tea shops too. 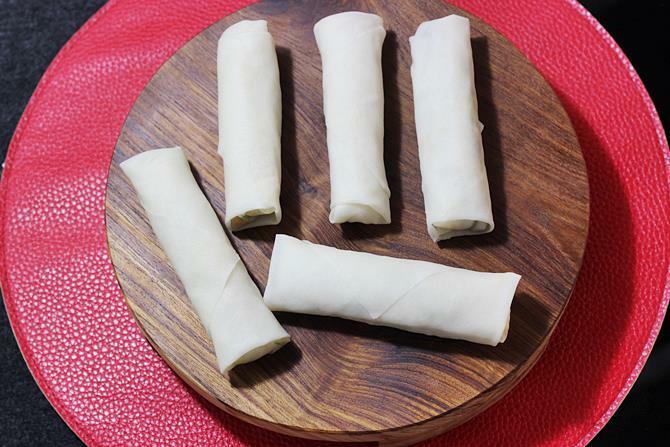 These flaky spring rolls also go perfectly well with a hot cup of black tea or coffee. 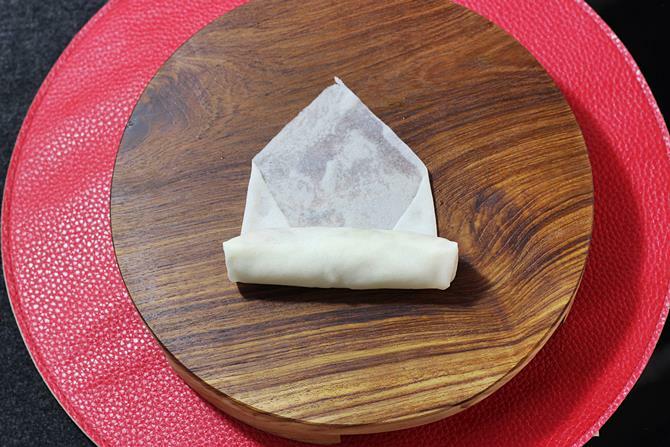 These can be made with homemade spring roll wrappers or with readymade frozen sheets. 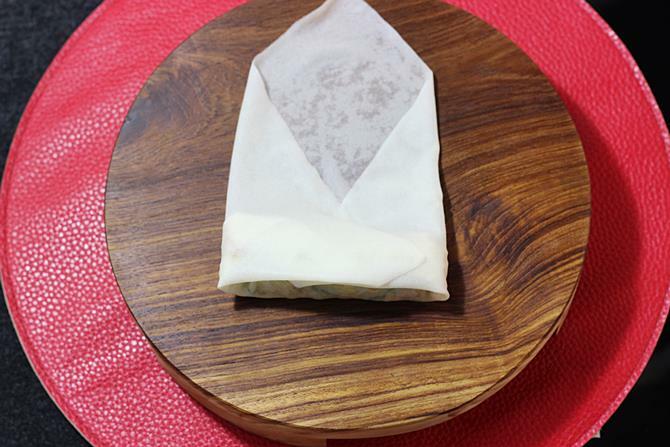 The homemade wrappers do not turn out as good as the readymade sheets. Since the ready made sheets are machine made and have an even and thin layer. That gives a great and even crust or crisp once they are fried. 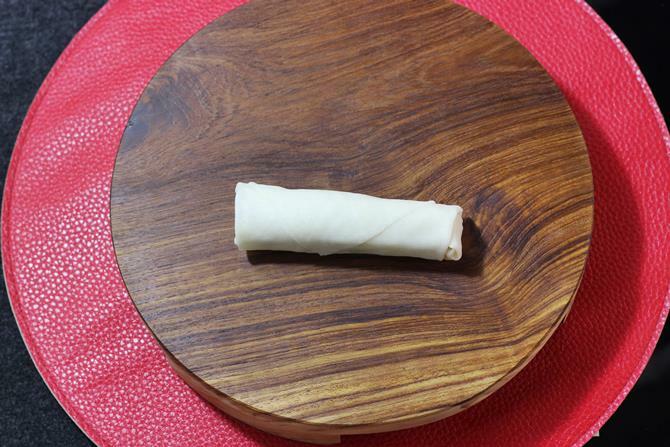 I make spring rolls only few times a year. So I prefer to use the frozen ones. 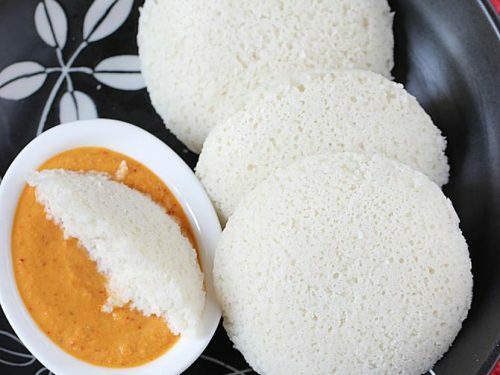 You can find frozen sheets made with rice flour, wheat flour and plain flour too. I used ones made with wheat flour considering them to be okay as they are free from refined flour and preservatives. 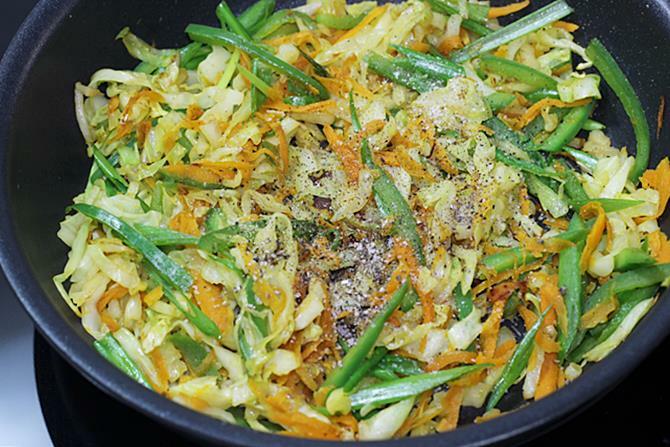 The stir fried cabbage filling that is used here is very delicious. It can even be used for making wraps or sandwiches too. 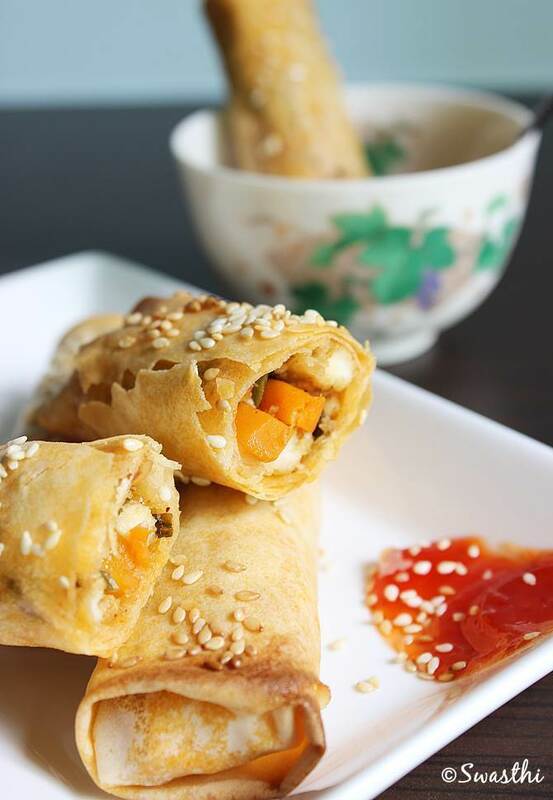 This recipe yields vegetable spring rolls just as delicious as you find in any Chinese restaurants. There are no noodles used in this recipe. But if you like to then use about 1 cup of cooked noodles or half cake. 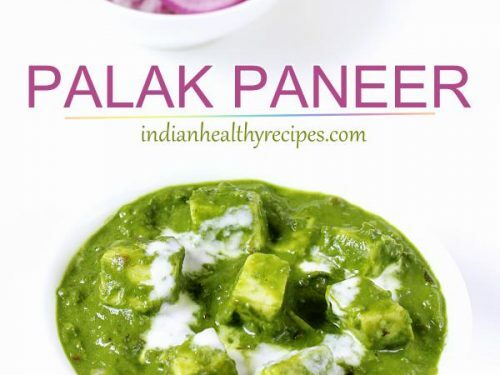 For the kids I make these with paneer and vegetable filling in a Indian style. I prefer to keep them away from soya sauce. Cauliflower, beans, broccoli, spinach and potato can also be used. These can be baked as mentioned in method 2, after the recipe card. 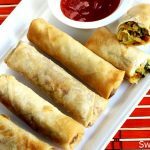 Chinese veg spring rolls recipe – Vegetable spring rolls made with mixed vegetables and frozen sheets . These make a great tea time snack and can also be served as a side in a Chinese meal. 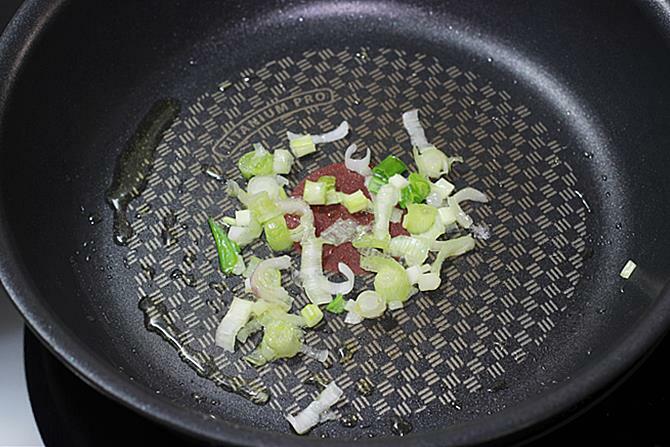 Add oil to a hot pan and saute spring onion whites. Add all the veggies except onion greens. Fry on a high flame until half done yet crunchy. Add soya sauce and vinegar. Mix well. Add onion greens, pepper and very little salt. Mix and off the stove. If You wish to use noodles, boil them al dente. Rinse well and drain completely. Add them to the stir fried veggies and fry for a min. Pour more 1 tsp soya sauce. Sprinkle some salt and pepper. Place a damp cloth over the frozen sheets for 5 to 7 mins or follow the instructions mentioned on the pack. Spread one wrapper, place a spoonful of stuffing. Roll one edge towards the inner side covering the stuffing. Bring the sides to the center. 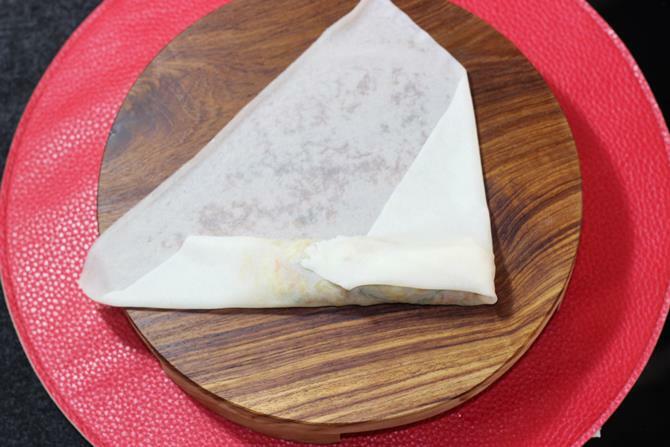 Dampen the left over edge and roll the wrapper to seal. Keep them covered otherwise they will dry up..
Heat oil until hot enough. To check drop a small piece of wrapper in the oil. If the oil is hot enough It rises in the oil without browning. 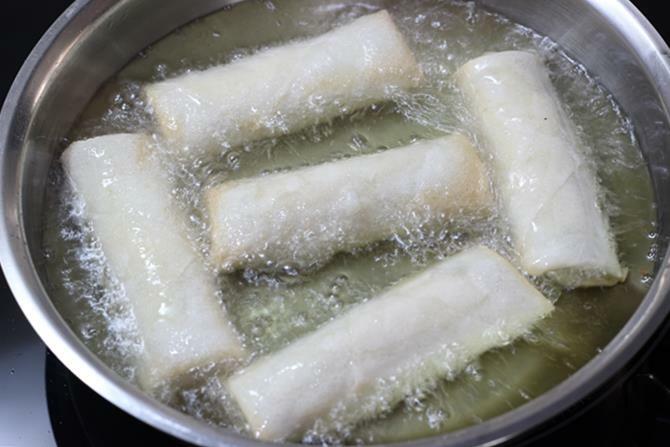 Add the rolls in hot oil and fry evenly by stirring until golden. Drain them on kitchen tissue. 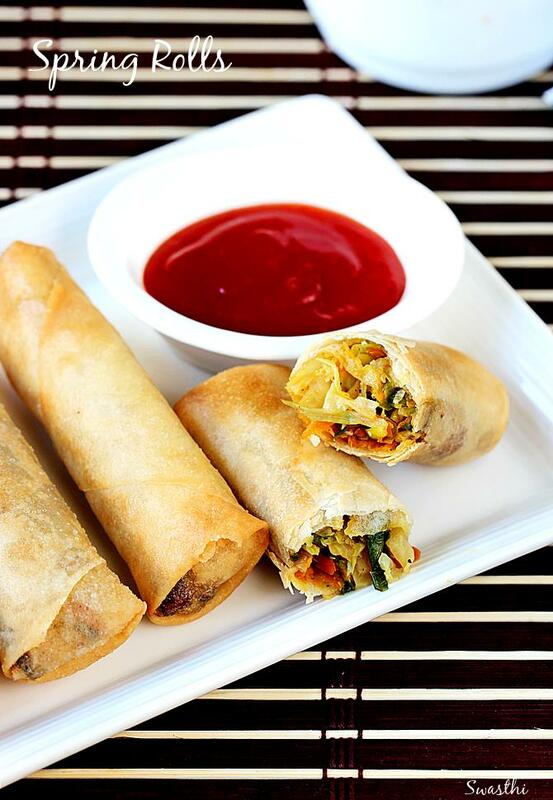 Serve vegetable spring rolls hot with ketchup. Preheat the oven at 220 C for at least 15 minutes. Brush the spring rolls generously with some oil. Place them on a greased tray and bake for 12 to 13 mins. Even a wired rack works well. If needed flip them and bake for another 6 mins. 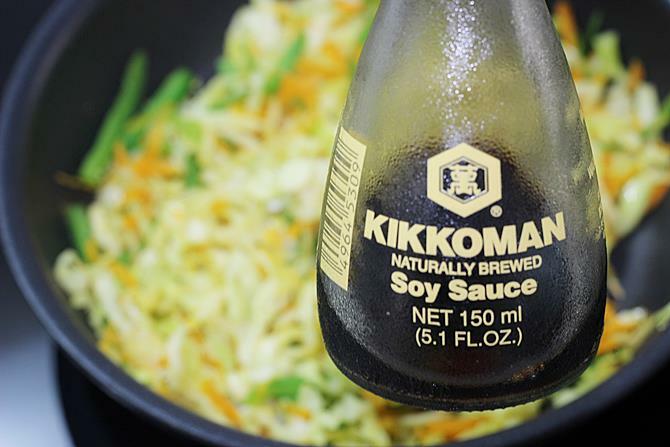 Serve spring rolls hot with any sauce. 1. Heat oil in a wok or pan. The entire filling has to be cooked on a high flame. Saute spring onions just for a minute. 2. 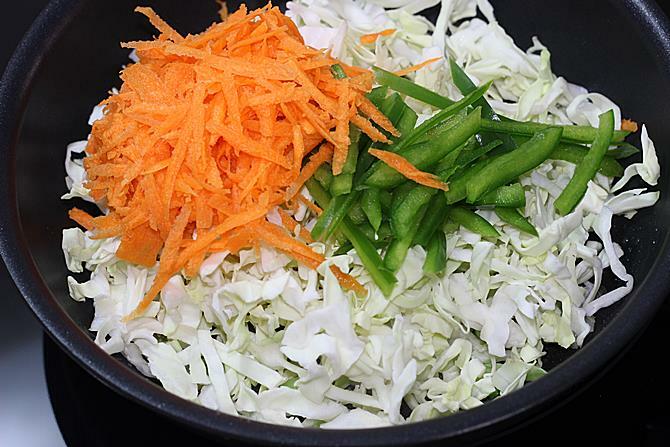 Next add shredded cabbage, carrots & capsicum. You can add bean if you like and can even skip capsicum. The restaurant rolls I ate in Singapore never had beans in them. 3. Saute until the veggies are half done yet crunchy. Add soya sauce. 5. Next add spring onions, pepper and very less salt. There is also salt in soya sauce and even in wrappers as well. So take care not to add too much. 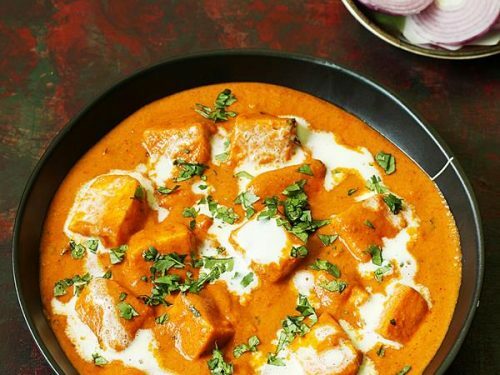 Turn off the stove and set aside to cool. 6. Follow the instructions on the pack to remove the individual wrappers. I usually place a wet cloth on the bunch of wrappers for 5 to 7 mins. They begin to come out easily when pulled. Place one on the work area. Place the stuffing as you see in the pics. 7. Begin to roll one of the edge wrapping the edge as you see in the pic. 8. Next bring the other side to the center. 9. Repeat that on the other side as well. Dampen the wrapper on the edges. 10. 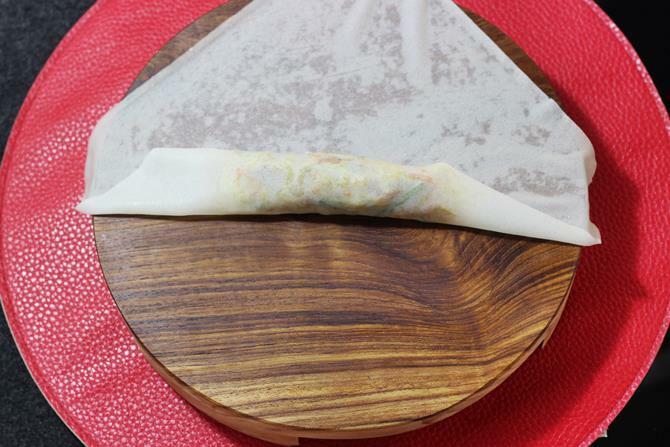 Roll it tightly towards the left over edge. 11. Seal it completely. Finally keep it covered with a damp cloth. 12. Repeat making the same way until you finish the filling. Keep them covered until you fry. 13. Heat oil in a deep pan until hot. 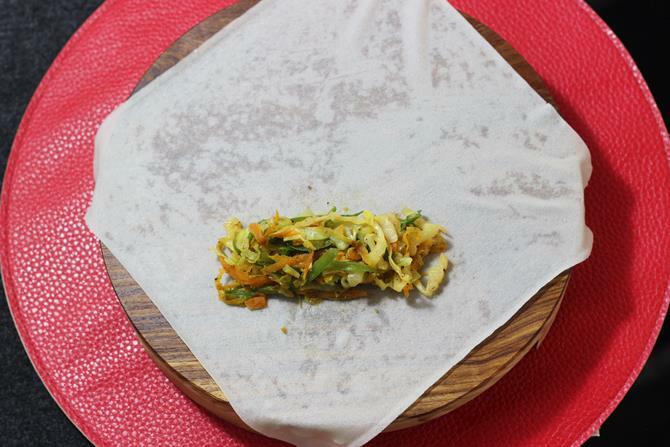 You can drop a tiny piece of a wrapper to the hot oil to check. It will rise if the oil is hot enough. Keep stirring for even frying. 14. When golden, transfer them to a kitchen tissue. 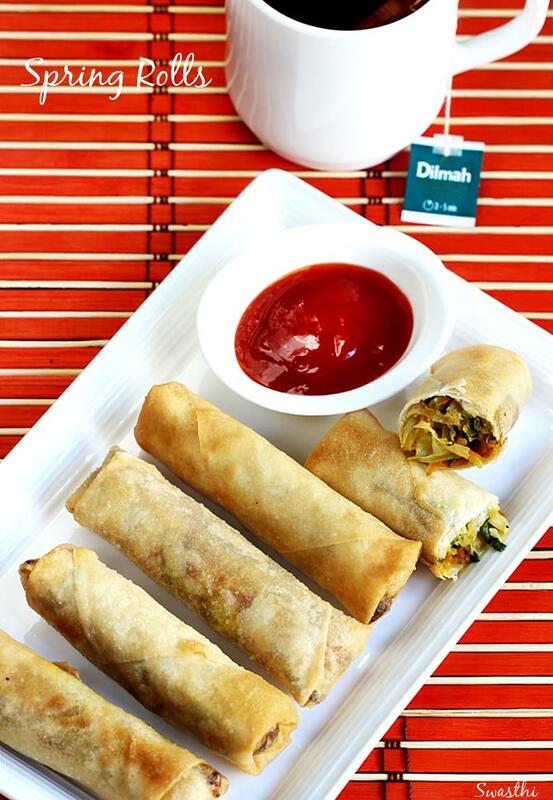 Serve veg spring rolls with ketchup or tea. 1. Heat a pan with oil. Add cumin, garlic or ginger garlic and sauté till it becomes fragrant. Add all the veggies and stir fry on high for 3 to 4 mins. 2. Add all the other ingredients mentioned under stuffing and mix well. The stuffing is ready. Preheat oven at 220 C at least for 15 mins. 3. Place a damp cloth over the frozen sheets for 5 mins. They begin to come out easily when you pull out. Replace the damp cloth on the rest of the sheets. 4. Next place a sheet and add the stuffing as shown in the picture. 5. Roll one edge towards the filling. And continue to roll till the center. 6. Bring the other 2 sides to the center and place them. 7. Continue to roll. Apply the flour mix over the edges and gently press it over the roll to seal. 8. This way, finish rolling all. 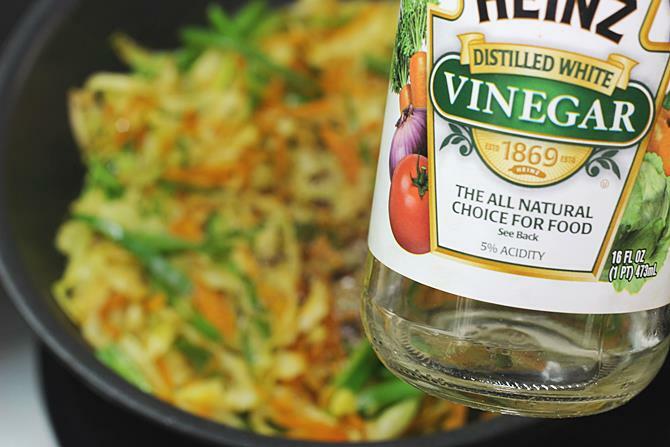 Brush them with a generous amount of oil evenly. 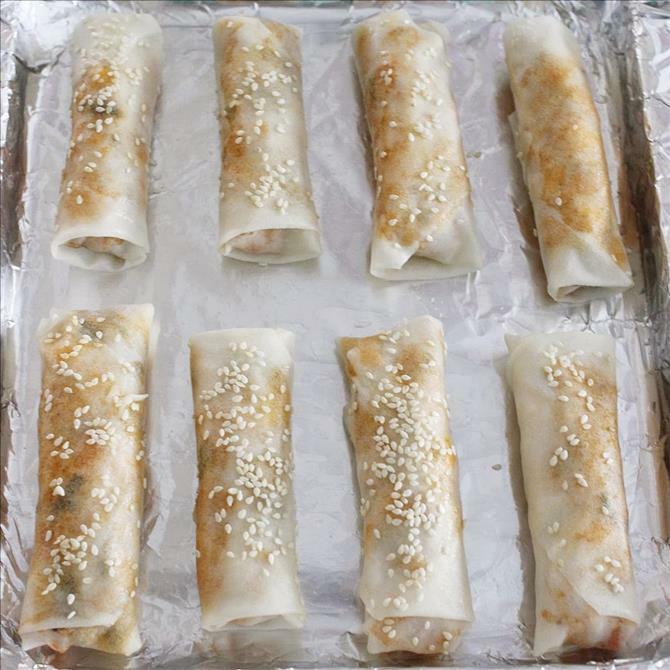 Sprinkle some sesame seeds and place them on a parchment paper or greased foil. 9. 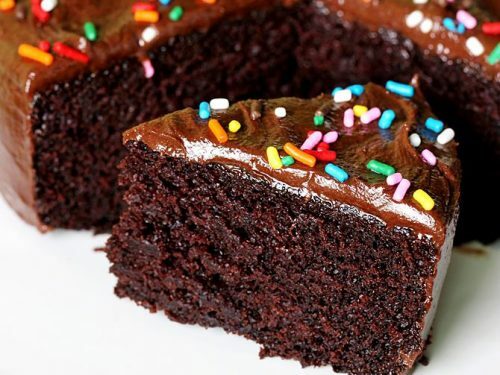 Bake them for 12 to 15 mins. I do not flip them to the other sides, mine gets baked evenly on all the sides. These can also be shallow fried or deep fried too. 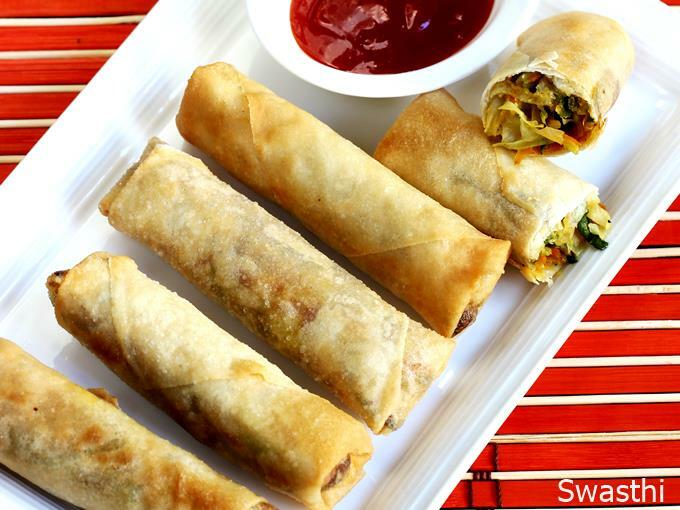 Serve vegetable spring rolls with your favorite sauce or dip. Yummy spring rolls. They baked very good in the oven. Thank you. I scrambled some eggs. Awesome!!!!! My kids love any food I make from your blog. Thank you. I baked the spring rolls. They loved them very much. Going to make your dal makhani tommorrow. Will keep you posted. you are welcome. Happy to know your kids loved the spring rolls. Thanks for the comment. 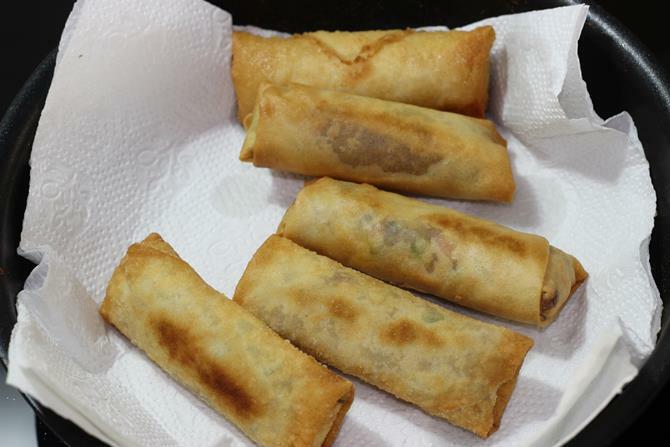 Will the spring rolls be crunchy and taste the same if baked rather than deep frying? they will be crunchy. Make sure you brush some oil over them before baking. 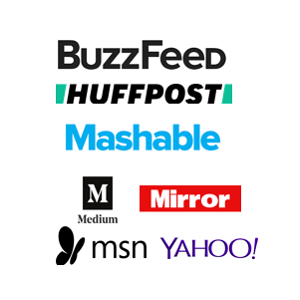 I simply love this site.. it’s way above what i had expected of any recipe site. #kudos. Well am new here and i wonder if it is the least possible for one to subscribe or something (in order to get periodical updates probably on gmail of any new recipes). Would like to sign up. Thanks a lot. I have added your email id to the subscription list. Please confirm it after you receive the mail. 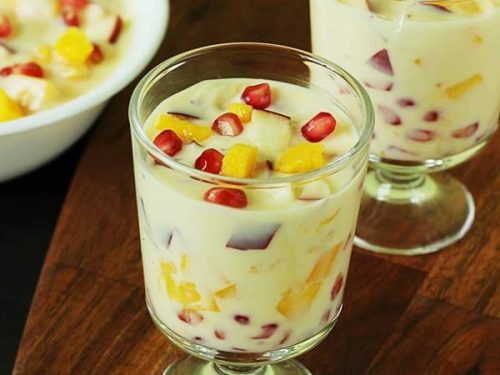 this is very look nice and beautiful ,delicious snacks . Glad to know the recipes are useful. It’s look very tasty swathi.where should we get that spring roll sheets.I am staying in bangalore.